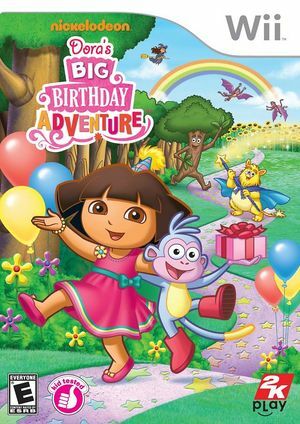 Give Dora a happy birthday in Dora's Big Birthday Adventure by helping her through a magical land in this game based on the Dora's Big Birthday Adventure prime-time TV special. All of her friends are waiting to throw her an unforgettable party, but Dora is trapped in storybook land! Help her and Boots get home so she can blow those candles out. Jump, climb, swing, and slide through a magical world. Visit Wizzle Mountain, the Dancing Forest, and other whimsical places. When Dora gets stuck, let Boots take over and wiggle out of (or into) tight spots. Older players can help little explorers by grabbing a second controller and activating the Helper Feature. The graph below charts the compatibility with Dora's Big Birthday Adventure since Dolphin's 2.0 release, listing revisions only where a compatibility change occurred. This page was last edited on 7 January 2018, at 10:30.